The modern Ultra Fast Trench MOSFET Enhancement Mode Field Effect Transistors LED display drivers deliver a bright, crisp LED display as well as a uniform dimming function across all display segments. The New PLT-1 LED Watch Module Will Repair The Following Watches. Using the enhanced modes of operation a single button (Time) only watch would be able to display in addition to standard Time functions, the Date, Weekday and Year! A two button (Time) & (Date) watch would be able to display, in addition to the standard Time and Date, the Weekday and Year. User Manual for the PLT-1 Replacement Pulsar LED Watch Module. 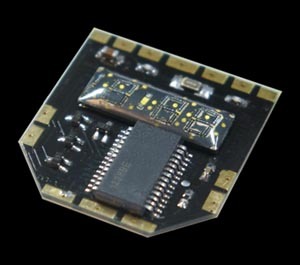 A Blog article on the development of the PLT-1 Pulsar LED Watch Module. We Guarantee the PLT-1 Modules against defects for a period of 18 months from the date of purchase, regardless of the owner. We maintain a database of PLT-1 serial numbers to facilitate this. This Guarantee does not include old parts re-used from your old module and transplanted on the PLT-1 module. Recommended batteries to use with the new PLT-1 and the original modules are Genuine Swiss made Renata Silver Oxide type 357 (SR44W) 1.55 Volt Batteries or Energizer type EPX76 1.55 Volt High Drain Silver Oxide Batteries, not cheap copies from far east! 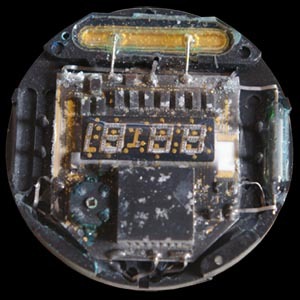 Send us your faulty watch or module, we would try to reliably fix your watch / Module first, failing that as long as the LED Display is good in your watch we can replace the module with the new PLT-1 module and get it working. We would remove the Original LED Display from your old faulty module and transplant it on to the new PLT-1 module, then we would insert this new module on to the plastic carrier along with the reed switches that your old module came with to ensure you get your own parts from the old module back and not some ones else's old parts also it ensures correct reed switch alignment for the buttons. The new PLT-1 Module costs £100 Pounds, and includes all the work needed to remove and transplant your old parts on to the new PLT-1 module. We also stock Genuine Swiss made Renata Silver Oxide batteries at the cost of £4 Pounds each. If not available a set of home made battery spacers will be supplied for free when purchasing batteries. I sent my vintage Hamilton QED Watch from the USA to be repaired. Pulsar LED Time (Ben Azari) installed the PLT-1 module while maintaining the watch's original LED display and magnetic time setting functions. I was extremely pleased and satisfied with the work Ben did on the watch. Email communication was great and I understood what was going on with the watch every step of the way. He tested the watch thoroughly before informing me that it needed a new module and the watch was repaired in a timely and cost-effective manner. There are just a few people who are capable of fixing these unique vintage timepieces. I would give Pulsar LED Time and Ben Azari my highest recommendation. My 40 year old Hamilton QED watch needed a complete overhaul. Pulsar LED Time replaced the module, tuned and cleaned the watch returning it in better working order than when this watch was first purchased in 1973. I give Ben 5 STARS and highly recommend that anyone needing to restore their vintage watch to working order have Pulsar LED do this delicate work. Great job Ben and thank you for your EXCELLENT service! Ben is absolutely amazing. He went above and beyond the call of duty to get my Pulsar operational. He kept me informed during the entire process. I would highly recommend Ben and his services to anyone looking to get their LED watch repaired. I could not be any happier, thank you so much Ben. I had tried to find someone who could fix my Pulsar 3120 watch for a number of years. I bought this watch 40 years ago and now it works like the day I bought it. I purchased a Pulsar on August 9th 1974, the same day Richard Nixon left the office of president here in the U.S. I was a young guy and thought the watch was the coolest thing ever. I loved the uniqueness of it and it never failed to elicit reactions from people. It stopped working in early 1976 and it sat in a drawer since then. I thought the most I could do was show the non-working watch to people and tell them how ahead of its time it was way back when. Then I found Pulsar LED time and Ben Azari. After a couple of E-mails getting things set, I sent my old module to him so he could use some parts and Ben sent a new module back to me. After reassembling the watch, I pushed the button and saw the display light up for the first time in decades. I was amazed and transported back to another era with so many memories. As others have mentioned, I was kept informed every step of the way and the turn around time was very fast. Ben, thanks so much for bringing a wonderful part of my past back to life. If you have an old Pulsar or other vintage digital watch that needs repair, look no further than Pulsar LED Time! What can I say? Ben is amazing. His professional handling of my Pulsar P2 was just that. From my initial email inquiry to receiving my watch back in very quick turnaround. After searching for what seemed like forever all over the internet I truly felt the watch would never see the light of day again. After Ben received the watch and inspected he assured me that with a PLT-1 transplant it would again come alive. Last night I wore the watch out for the first time in over 35 years and was very proud to again wear it with pride. Thank you Ben for all of your expertise. How strange it was to press the button on my old pulsar last week. For the past 40 years, I would occasionally take it out of the top drawer and press the button even though I knew nothing would happen. But last week it arrived from Dr. Ben and this time when I pressed the button, memories flashed as bright as the display before me! For a millisecond, I was back in the U.S. Air Force in 1974 in Biloxi, Mississippi where and when I had bought it. Very cool Ben! Thanks for the time travel! I have an Omega Time Computer purchased in 1974. This year the watch failed all I could get on the display was a single digit, I checked with numerous watch repair services in Swansea but no-one could offer any help. Then I found Bens web Page. He carried out the necessary repair within a week, I am realy pleased with Bens work and would recommend him to any one. Many thanks Ben. Hi a live in Mexico, you can sed to my contry one module? Ben does excellent work. Fixed my P2 and it's better than new. It is doubtless a labor of love for him. You won' be disappointed with his work. It's wonderful to see Pulsar 3 working again. It's been sitting around for the last 15+ years, hoping one day it may work so thanks to Ben for reviving the watch....... Great Work and Thanks. I just e-mail another friend who the same watch, we'll see if he's interested. all the way from Chicago and back, 100% a great experience , watch sat unused and forgotten since 1978 . Brought this watch back from the dead. Hello Ben i need your help with my Omega LED Watch. Can you fix it for me please? I am thinking of using the Watch every day but it's not working OK! Which address can i send the watch to? Ben made perfect repairfor for my Omega TC 2. I satisfied the condition in unchanged the 'DOT'LED type. My watch is working with early '70 LED module. My Pulsar stopped work in the late 80s. I had sent it out to different repair providers with unsatisfactory results. I came upon Ben website and decided to give him a try. After many years sitting in a drawer, I am not able to again wear my Pulsar, which now keeps perfect time. Ben's charges are reasonable and the turnaround time quite acceptable. Thanks Ben. Having purchased a non working P2, I read about Ben's work and after exchanging emails sent the watch for his attention. Sadly not only was the main module acid damaged, but the original dot display as well. Ben advised that both needed replacing and he would attempt to source the correct dot display - imagine my surprise when I received an email just a week later to advise all the work was complete and the watch ready to be returned. Having received the watch today, I cannot commend Ben highly enough in the quality of his work - the display is bright and crisp, all reeds work as intended just as when it left the factory in '73. Timekeeping will be judged in due course, but if it loses or gains a few seconds, so what - it's only time. Superb. My watch is absolutely fantastic! It feels brand new. A+++ rating for customer service and quality of (amazing) work. Thank you for bringing my old watch back to life! Is this firm still alive ?? I do have a Omega TC1 in NOT working order and is the price for fixing it still 100 £ ?? This place is for customers review, you should email us if you have any questions. We are still here and will be fixing these old LED watches for many years to come. Prices are as advertised above!